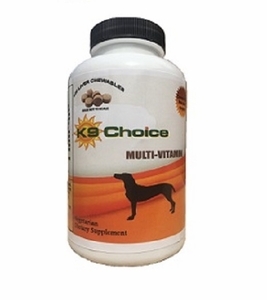 K9 Choice Multivitamin for dogs120 servings. Liver flavoring. 20 vitamins and minerals vital for canine health. Give one tablet for each 20 lbs of weight once a day. K9 Choice Multi-Vitamin comes with 120 tablets. A 10 lb dog gets an 8 month supply; give half a tablet per day. Tablets are easy to cut in half. Dogs can eat vitamin by itself or in food.